I usually stop once or twice at Sheepeater Cliffs while in Yellowstone National Park, hoping to photograph the yellow-bellied marmots that are found there. This time I was disappointed: it was too late in the year and they had gone to ground for the winter, and I could not find any of them. 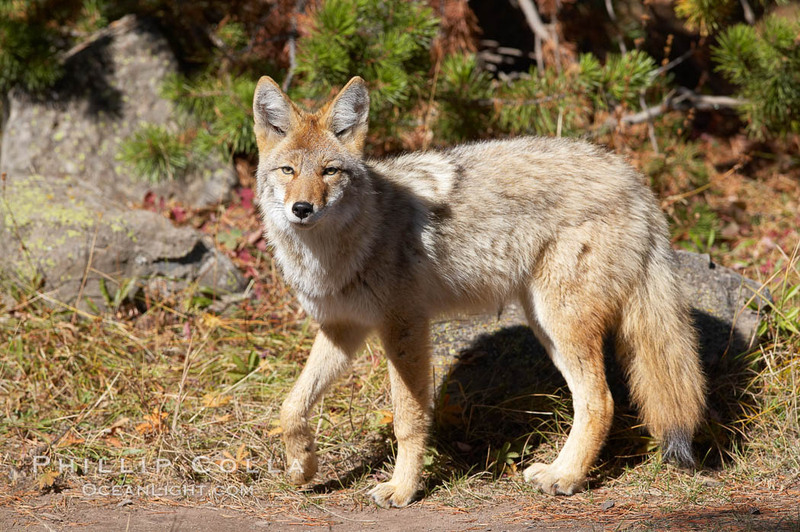 As I was kicking back and eating my lunch before continuing on to Mammoth Hot Springs for the afternoon, a coyote (Canis latrans) strolled by and started working in the brush along the river, presumably for voles or other small varmits. He was pretty comfortable with my presence, so I walked along and watched him for a while, taking photos.